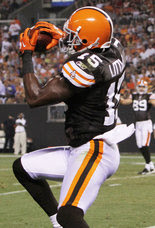 Browns players overvalued in our fantasy draft--how about yours? In one of Bill Simmons' podcasts recently, he remarked that although some national observers are feeling good about the Browns, he isn't--because not one Browns receiver was drafted in their fantasy draft the other day. Now, I get what he's saying--every #1 runner and catcher usually gets drafted, they get touches by default. But in the Browns' case, there's just a wide selection of targets for Colt McCoy to throw to--and it's quite possible that nobody will have "decent" fantasy numbers from the WR position this year. That being said, I wonder how much local fans overvalue their hometown teams. I have a long history of not picking Indians or Browns for my team, from a pure value perspective. I can't justify picking up Carlos Santana five rounds too early just because I can watch him play every day. We had our own fantasy draft the other day. And I wanted to compare where Browns players were taken compared to other (non-Cleveland-based) leagues. Note that ours is a 12-team league that drafts 17 rounds, so it's a bit deeper in rosters than most. But still, an obvious bias was formed. I compared them to the ESPN Experts League, which is a 10 team league, the CBS Experts: league, which is 12 teams but only 14 rounds, and also the ESPN online community (all the leagues that run through ESPN), which are normally only 10 teams--and so only show the top 170 players. Really, only Peyton Hilis was a sure thing to be drafted in other leagues. Some have Colt McCoy being taken, and maybe a little bit of Montario Hardesty or Greg Little. But not much love for the Browns from NFL fans more than a hundred miles of the Forest City. Note some of the differences--and have you seen similar patterns in your leagues? Hell, even I played into homerism this year, so I'll be rooting for lots of defensive or Cribbs return touchdowns, and maybe Greg Little will see some PT at some point too.